Find books, movies and more in the library. You have the device, we have the media. 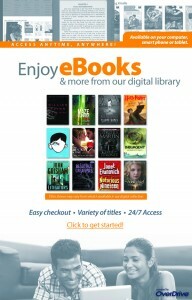 Download eBooks and eAudios to your favorite mobile device. If you need help with eReaders that will work with Overdrive, visit the Device Resource Center. Find videos & instructions from Overdrive help.